Remember the comic book drawings of Superman, with his black hair and its blue highlights? Black n Bleu is truly True Blue-Black. 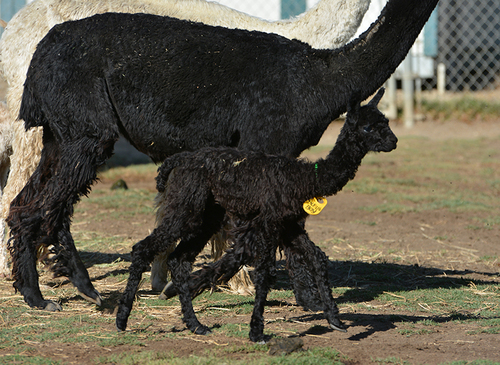 She has black genetics very deep in her pedigree, and based on this year's cria, she is poised to produce it too! She has a lovely temperament, and loves to take goodies from your hand, but isn't "pushy" about it. She's always ready, though. Bleu has produced 3 true black crias for us. 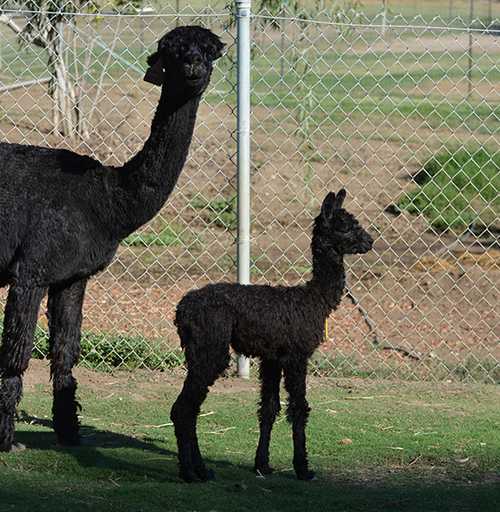 She is open, and ready to breed--for free- to any of our solely-owned Windy Hill herd sires, which include WI The Admiral--full brother to Vader!-- and GLR Suton, son of champion-producing Cinders. You have nothing to lose with this girl. If you love black, you will love Black n Bleu! She has blessed us. Now let her bless you. Give me a call and let's talk about it.